Whoopi has served on the Advisory Committee for FilmAid International. Since 1986, Whoopi has been hosting the Comic Relief television specials benefitting charities helping the homeless alongside good friends Robin Williams and Billy Crystal. 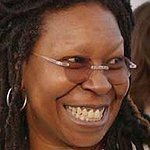 In addition, Whoopi was named a UNICEF Goodwill Ambassador in 2003, and serves on the Board of Garden of Dreams. Google trends for "Whoopi Goldberg"